Enfield — Homemade salsa, enchiladas, salad and sweet corn were what’s for dinner on a recent Tuesday evening in the farmhouse at Visions for Creative Housing Solutions. As usual, residents had pitched in with the preparations, cutting tomatoes, husking corn. After dinner, Kim Wolk, who lives at Visions, started loading the dishwasher in the farmhouse kitchen. Sylvia Dow, Visions’ executive director, gave a playful nudge to those who still sat at the table, chatting. There’s no maid here, she said. The new nonprofit offers housing options for adults with special needs. The most independent live in studio apartments, and those needing more care have private rooms in the farmhouse, where a staff member is on duty overnight. A supported apartment is for people who are not quite able to live on their own. A lively place with people coming and going throughout the day, Visions has a vegetable garden, chickens, turkeys, a horse, cat and dogs . Residents can have their own pets. “It’s like renting an apartment,” said Dow, whose adult daughters Ashley and Emma live at Visions, which until recently was their family home. Eight people live at Visions, formerly Kluge’s on Sunset Hill Inn, and there’s room for two more. Social Security pays for their room and board, and money for assistance, such as a mentor, comes through PathWays of the River Valley, which supports people with developmental disabilities and brain injuries in Sullivan and lower Grafton counties. Everyone has paid employment, and with working, volunteering, errands and other commitments, their schedules vary. The people who live in the apartments sometimes cook at home, but it’s not unusual for a group to gather at the farmhouse to share a meal, watch a movie or play games. Niki Gilmore moved in last June after graduating from a residential school in Massachusetts for people with learning differences. Once a working farm, the property had been in Dow’s family since 1954, when her parents, John and Erna Kluge, bought it. The couple, German immigrants, turned it into an inn and added a four-unit hotel. After the Kluges died, Dow, her brother, and her husband, David, ran the business . Generations of families returned every summer, some staying for months. The business came to an end in 1997. “We decided it was too difficult to run the inn, especially with two special needs children,” said Dow, who had just started working as a special education teacher. 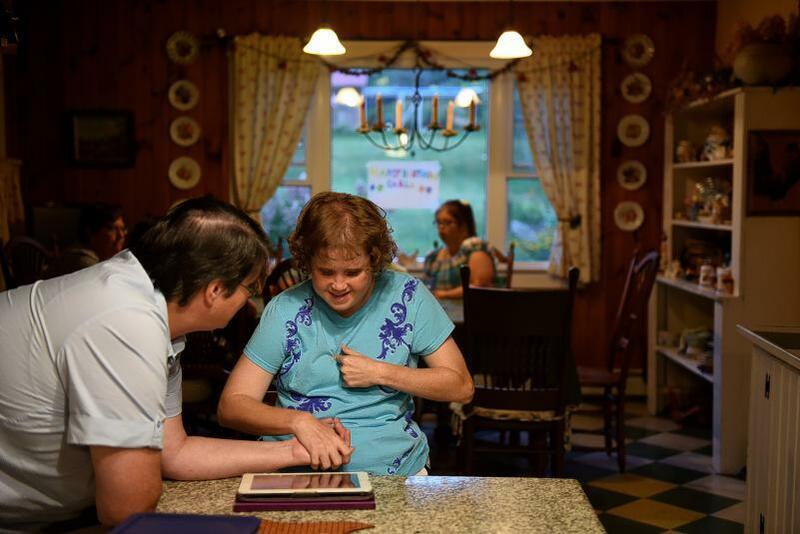 The Dows moved into the farmhouse, which would also become home to several other women with special needs; Dow became a homecare provider a decade ago after one of Ashley Dow’s best friends lost her provider. The idea for Visions was born 14 years ago, when Dow and other family members of people with special needs started talking about housing possibilities. They came up with the name and essentially the same mission, she said. But with two young children, life was busy for the Dows, and Visions remained on hold until a medical crisis created a sense of urgency. In 2011, Dow was diagnosed with a brain tumor. The tumor was removed during surgery, but in the process, she developed an infection that required an emergency operation. “I almost didn’t make it,” said Dow, who worried about what would happen to the kids if she died. Creating Visions would ensure they’d always have a home, their home. For the next four years, the Dows and other families of people with special needs worked to make it happen. Traveling in small groups, they visited nonprofits with various residential options throughout New England . “W e took a little bit of everything that we liked,” Dow said. After seemingly endless paperwork, Visions gained nonprofit status last year. The Dows sold 80 acres of their family land to the organization and moved to a smaller home David Dow built nearby. So far, they haven’t received any money from the $757,000 sale. Maybe down the road, “if at some point, Visions can pay us,” Sylvia Dow said. When it comes to living situations for adults with special needs, Dow emphasizes choice. Some do well living on their own with support. Others are happy with homecare, living in a provider’s house, but that doesn’t work for everyone, she said. And like the foster care model, it has its uncertainties. If a caregiver does something wrong or gets burned out or decides he or she doesn’t want to do it any more, the person with special needs has to move, Dow said. That can mean leaving the community altogether, losing their job and friends. Having the organization up and running gives her peace of mind. If people leave, “they leave on their timeline,” she said. Visions has 10 staff members, and that could increase if more people move in, depending on their needs and interests, Dow said, and residents’ families are as involved as they want to be. The board members include David Dow and other relatives of people with special needs, some of whom also live at Visions. Residents and their families play a role in hiring and overseeing the staff, who can help residents work toward their goals, which might include anything from finding a job to eating healthier. Or spreading their wings. This summer, Ashley Dow moved from the farmhouse to the supported apartment, which she and Gilmore share. “I got very scared because I never had an apartment before,” said Ashley Dow, who worried about the increased level of independence and whether she’d be a good roommate to Gilmore. But things are going well. Maranda Hutchins has lived on the property for 11 years, first in the farmhouse and then in the supported apartment. Recently, she took an apartment next door to Wolk’s. Prior to the move, she was nervous about whether she and Wolk would get along and how her cat, Atticus, would weather the change. “It worked out great, as it turned out,” Hutchins said.